Very little, if any, attention is given to the laundry room during a home remodel. Maybe this is because it is one of the few rooms in the house to be strictly utilitarian. Maybe it’s simply because there are very few people who actually like laundry. Whatever the reason: Stop it. Your laundry room, even if it is small, can be beautiful and fun as well as utilitarian. Here are some of the things you can do to make your laundry room a more pleasant place. Yes! This is how you *should* feel about doing laundry! If your laundry room is small, try to use the space wisely. Make use of those stacking washer and dryer sets (Magic Chef 1.6 cu. ft. Top Load Portable Washer). 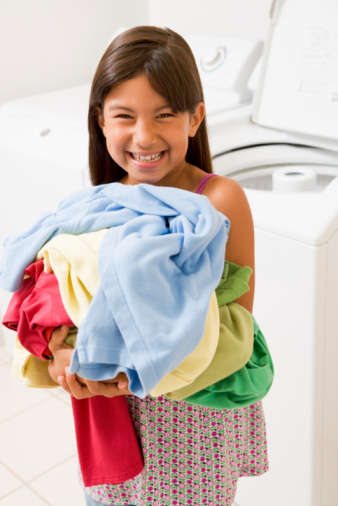 You might have to have smaller loads, but you’ll appreciate not having to edge around over-sized washers and dryers. You probably have some sort of utility cart in your kitchen, right? There are laundry room utility carts, too! According to Martha Stewart, the best laundry utility carts can pull double duty as an ironing board, which is extremely helpful if your laundry room is small…or a closet. Under-cabinet lighting can help make specific task work easier, says This Old House Magazine. Ambient lighting (like large windows or a ceiling lighting fixture) can make the space a lot more pleasant and homey. If your house’s plumbing structure will allow it, put a sink (the bigger the better) in your laundry room. You’ll use it to wash your hands after cleaning lint traps and dealing with grimy clothes. You’ll also use it for stain treatments and wringing out any moisture from garments that are hung dry instead of being put through the dryer. Why install a hanging bar in your laundry room? That way you can hang things up immediately and reduce the risk of wrinkles setting in. A cheap towel bar, when mounted on the underside of a shelf works perfectly! These are five things that will help make your laundry room a nicer space. What are some of the things you’ve done? Are you interested in creating a laundry room? Take a look at eieihome’s directory of general contractors.